Frustrated by several difficult trekking experiences using marginal equipment, amputee and SideStix™ co-founder Sarah Doherty knew there was a real need for better adaptive devices for people wanting to regain their independence. So in 2003, Sarah together with her partner Kerith Perreur-Lloyd, set off on their own journey to develop the world’s best performance enhancing mobility devices. 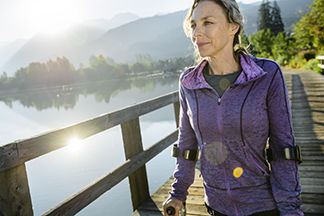 Drawing on Sarah’s inspiration and Kerith’s 20+ years in structural engineering, SideStix™ developed the first and only shock absorbent crutch with attachable tips for navigating any kind of terrain. Researched, designed and field-tested for over a decade, SideStix™ has earned a reputation for engineering the best performance enhancing mobility devices on the planet. Our patent pending designs provide the ultimate in joint protection, minimizes vibration and stress to the hand and unlike other forearm crutches, are the only device of their kind that maximizes comfort and safety over the long-term. Allowing you to walk further, push harder and climb higher with less effort and fatigue. SIDESTIX™ USERS DEFY CONVENTION EVERYDAY.